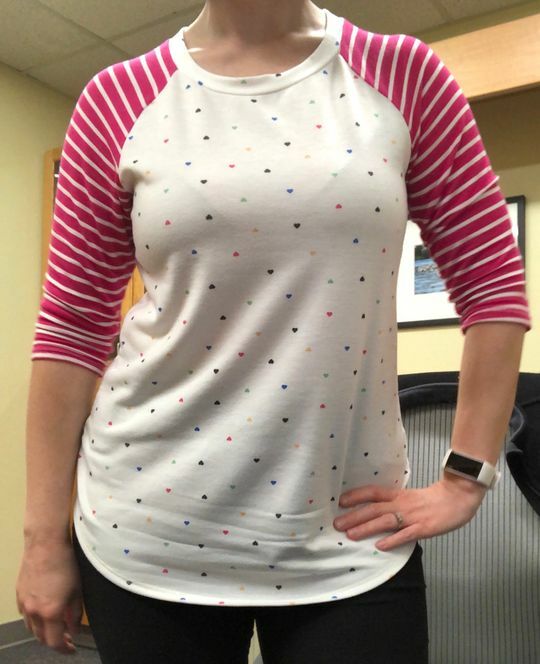 3/4 striped sleeve top with mini hearts all around the body that are multi-colored. Grab this for the perfect Valentine's Day outfit! Large: Bust 40" Length 29"
Karina K. Reviewed by Karina K.
Great light material, I wore it to my daughters birthday party and got a lot of compliments. Really good quality material. Love the cute hearts all over. Alissa A. Reviewed by Alissa A. Great quality top for the transition to spring. Love the colors! Cute but was much bigger then what I had thought or what looked on the models. Ordered a size S and fits more like a M.
Jill R. Reviewed by Jill R.
Love the colors and print. I do prefer my baseball tees to be a little more form-fitting, but I still love it. Just a little baggy.